It’s time to get those tails waggin’ and doggies howling, it’s concert time! The P&G Pet Care team is thrilled to announce the launch of Iams new SO GOOD! Dog food in Canada this summer! To celebrate, Iams is throwing Canada’s first ever concert for dogs – The Iams SO GOOD! Doggie Jam. On June 8, Iams is inviting you and your furry friends to join them and as many as 5,000 dogs and pet lovers to attend a classical music concert where a 42 piece orchestra will perform music created specifically for canine hearing. The Iams SO GOOD! Doggie Jam is a one of a kind event that is guaranteed fun for everyone in your family! To celebrate and showcase the unique bond passionate pet owners have with their pooches, Iams has created a short video that captures the loving relationships between four owners and their dogs. This video highlights the real love between dogs and their owners and gives you a taste of what the Iams SO GOOD! Doggie Jam will be like! Click here to watch the video. To enter to win, all you and your readers have to do is simply check out the Iams SO GOOD! video and leave a blog comment about What you loved most about the video! You can also earn bonus entries every day by sharing the Iams So Good! 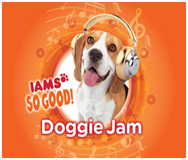 Doggie Jam video on Facebook, Twitter or Google+ using the sharing buttons on YouTube! A random draw will be held by Random.org on June 3, 2013 from all entries received. I love how much the owners bond with their dogs, especially the fact through music! I love this video, dogs are truly part of the family. I like how these guys dance, so much fun together. They all look so happy, dogs and owners.